Kiwi Expressions offer quality and attractive Fashion Accessory products, including Bracelets, Ear Rings, Necklaces, Shawls and Hair Accessories. We also have Housewares / Home Décor products. Everything is imported directly from China & shipped from our NY state warehouse. Satisfaction guaranteed or your money back. Wholesale gifts, home decor, bath and body, candles, Christian gifts, cool figurines, incense, fashion jewelry, home accessories, lanterns, seasonal merchandise and so much more! Discounts every day! No minimum. Order Toll Free: 1-855-EWGIFTS or visit http://www.eastwindgifts.com. Optima Home Scales is a distributor of small home digital scales. We specialize in pocket, bath, kitchen, and shipping scales. We bring over 15 years experience to offer and provide the best products, pricing, and customer support. Rideal Limited is a qualified manufacturer and exporter of the light-duty plastic hardware products, especially kitchen knifes, kitchen gadgets, innovative pocket gadgets, and accessories. Our company is located in Yangjiang city of Guangdong province in southern China (250KM to the west of Hongkong). We design and manufacture our products. We can bring the most profit for our retailers. If you are interested in our products, please contact us. Importers of high quality wholesale home textiles. Serving retailers nationwide in USA & Canada. Regal Comfort®, Virah BellaTM and Bamboo LuxuryTM brand our lines of mink blankets, bed sheets, comforters, curtains, dog beds, duvet covers, furniture protectors, pillows, shams and quilts. We are committed to producing the finest design and workmanship in Christian insignia, architectural commissions, and recognition awards expressive of religious thought for both retail and wholesale. Our expertise in calligraphic art and ornament reaches churches, schools and communities all over the world. Our company offers Self-Adhesive Vinyl Floor Tile, Hardware, Aluminum Foil Cookware (most is made in USA), Acrylic Picture Frames and document holders (made in USA), Heavy Duty Contractor Trash Bags (made in USA), Coloring Books & Puzzle Books (made in USA), and Reading glasses. LOW MINIMUM ORDERS! We are a wholesale supplier of AS SEEN ON TV merchandise including Housewares, Automotive, Novelties, etc. 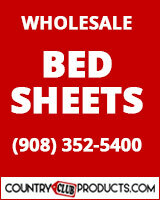 We are your place for pallets, lots and truckloads of quality Closeouts and Surplus Merchandise. We stock hundreds of pallets with various mixtures of products in order to supply our clientele and their ever-growing demand for discount and closeout goods. Mascot Hardware offers a wide range of products in cabinet hardware, door & window hardware, barn door hardware, reinforcement hardware and other home accessories. Mascot Hardware USA LLC was established in 2016 with a vision to supply quality hardware products to its customers in the North and South American regions. Diamond Visions, Inc. is an industry leading wholesale distributor of the best selling products in counter displays (PDQ/POS). We offer LEDs, cellphone accessories, sunglasses, tools, general merchandise, toys, c-store items, housewares, novelties, pet supplies and MORE!